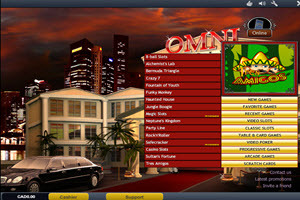 Omni Casino is a reputable online casino which offers more than 300 games, all of which are powered by Playtech. The site is one of the oldest casinos you will find still active and was established back in 1997,making it 17 years old now and that is an accomplishment not many can claim. The casino is owned by Peak Interactive NV, who are an online entertainment company. The license which Omni is operating under was issued by Curacao’s government, one of the leading gaming jurisdictions. There are a lot of reasons why a player should choose Omni casino, but one of the more important of those is knowing exactly what you’re getting yourself into. That is playing with a casino that has a long history of fairness and respectability. The software that the casino is built upon is offered by Playtech. It includes progressive jackpots, slots, video poker, roulette, keno, scratch cards and various other table and fixed odds games. 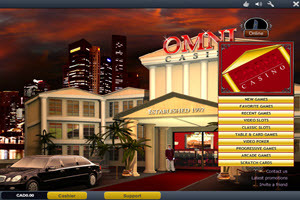 Omni casino seems to really enjoy giving players money for free as they offer deposit bonuses, both as welcome bonuses, reload bonuses, weekly Sunday bonuses and as a bonus for using an alternate method of payment. If that’s not enough, there is the loyalty program in place and special VIP services offered. Omni is powered by Playtech, which means that they offer some of the best designed games that this industry has to offer. Playtech is a giants by online gaming standards and have been in the business of creating games and software since 1999. They have compiled a library of games that exceeds 400 games and offer downloadable software, Instant play and mobile. One of the things that Playtech prides itself with is the fact that they have a partnership with Marvel and have created number of slots based on the characters that Marvel made popular. This includes so they create many of the slots that are based on the various comics and movies which are designed there. Thor, Ghost Rider, Iron Man 2, Hulk and Daredevil. The software s designed to be friendly, is efficient and includes multiple options that allow for players to reviews actions on their casino account. The banking section will list the various options which are available when they want to make a deposit or a withdrawal. The payment methods listed include credit and debit cards (Visa, Mastercard), Neteller, WebMoney, Instadebit, iDebit, Citadel, Skrill, Click2Pay, Bank transfers, Envoy, Ukash, Paysafecard, Entropay and a number of others which are offered for certain countries. Multiple currencies are permitted to ensure you can deposit in a currency you prefer. All transactions are 100% secure and encrypted. Omni Casino makes it clear that they offer support 24/7. They seem to be doing a well in this department and make sure that their team is friendly and highly trained. There are multiple methods of contact and this starts with email and then branches off to include telephone and live chat.